"It's time once again to ask a well-known photographer, instructor or otherwise interesting person the same 10 questions and ask them to Finish the Sentence! This week the sentences are finished by.... Laurie Excell. Laurie, please Finish the Sentence..."
Lightning Trigger www.lightningtrigger.com I love photographing stormy weather! I’ve learned the most from..
Moose Peterson, my mentor, my good friend and my "big brother." If I could go anywhere in the world it would be_____ because…. If I could go anywhere in the world it would be Africa because there is no other place that I have been where it feels more like a true wilderness with wild creatures at every turn. You get to experience the entire circle of life from birth, to survival, to death; family interaction, confrontation, play and so much more. The landscape is so foreign to anything we have here and the people are so beautiful and colorful. allows me to bring my vision of the world to life in my images. Creativity doesn't end with the click of the shutter. is so intimidating to newcomers. It is a huge, powerful and yet wonderful beast that literally scares people when they first encounter it. I would quit my day job sooner and followed my dream... But, hey, I'm doing it now so, no regrets! follow your dream...pursue your passion...give it your best shot! Continue to be curious about the world, passionate about what you do and share the beauty you capture through your photography with others. Ladies, Gentlemen, let's hear it for Laurie Excell! Laurie spent the first 25 years of her career in photographic sales helping pros and hobbyists alike decide which photographic equipment best suited their needs. All the while, she was an avid photographer. In 2000 she left sales to become a full-time professional wildlife and nature photographer. She has been published in Outdoor Photographer, Outdoor Photography (UK), Photoshop User, and Layers magazines. You will also find her photography on Audubon calendars, as well as postcards, calendars, and posters for the National Park Service. 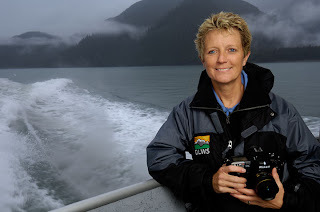 As if that's not enough, Laurie also leads wildlife photography safaris in North America and is an instructor with the Digital Landscape Workshop Series and Photoshop World . She also runs a business called EQuipmentLady, where she sells photographic equipment on consignment for other photographers when they upgrade their equipment. Oh, and in all of her spare time, she's the Photo Equipment Advice Desk Guru for the National Association of Photoshop Professionals. Thanks for the CS4 training in Arlington yesterday. As always the Kelby Training session was great and your presentation made it perfect. Learned some new stuff I'll be trying out as soon as the grandkids are picked up after their sleep-over. I enjoy reading Laurie Excell's blog. So, it was nice to see her as this week's "Sentence" guest. I have been fortunate enough to attend one of the DWLS workshops with Moose, Joe and Laurie and I must say... Laurie is the most generous, kind, caring individuals I have come across in photography. She is more than willing to share anything and everything she knows to help you achieve your photographic goal. She has the patience of a saint when it comes to newbies and photoshop! Great to see Laurie's comments here. I've been lucky as well to attend a DWLS event with her and she was fantastic. She was so very approachable and helpful and didn't mind you getting in there to look through her camera :-)). Just a wonderful person. Hi Laurie -- just catching up on some blog reading and was delighted to see you on the "Sentence". I was on a safari of Laurie's in Florida -- what a great learning experience with a talented generous photographer!